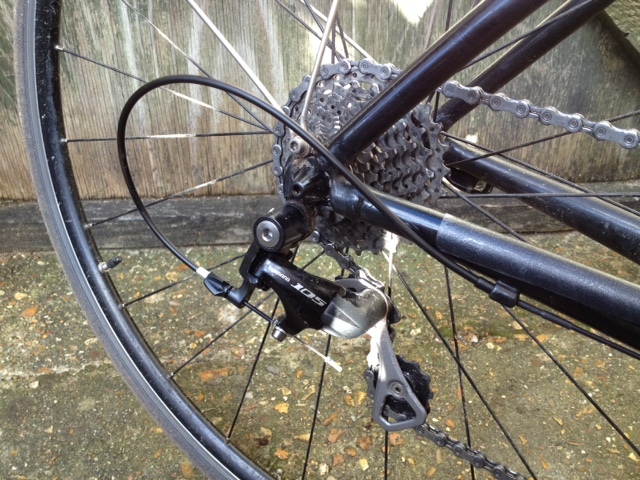 After a few mucky rides this winter I decided to try sealed gear cables. Instead of splashing 100odd quid on fancy Nokon system I’ve tried figure out how to make it cheap. 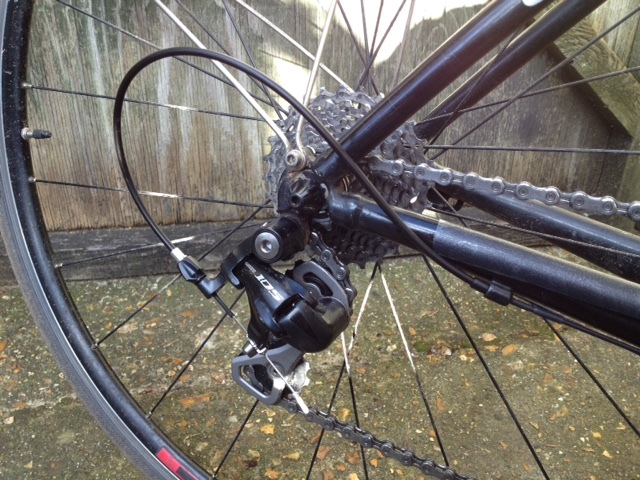 I used Shimano Shimano SIS SP41 with “long nose” (about £1.4 each) plus Nokon teflon liner (£11 for 5m – enough for two bikes maybe three) and standard gear cables set from Shimano (about £14-17). There is two most problematic points: bottom bracket cable guide and rear dérailleur ferrule mount an chainstay so the idea was to make the gear cables running “inside a pipe” all the way from levers to mechs. 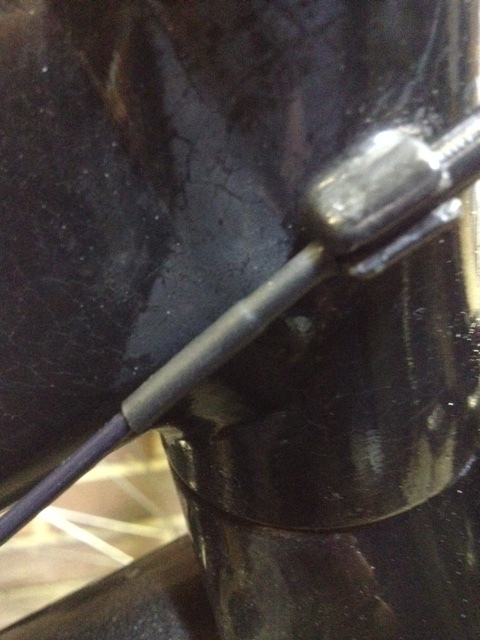 At first I,ve fitted handlebar parts of cabling as usual, and instead of standard ferrules I’ve used “nosed ones”. 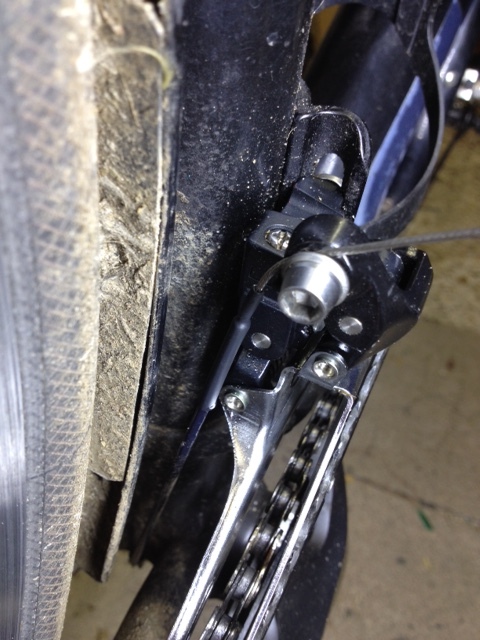 The bike is upside down as it was more convenient to clean/fit bottom bracket guide. 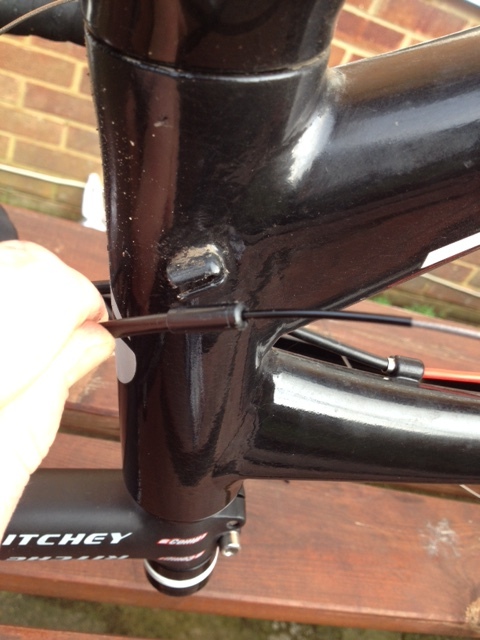 Then I measured/cut the liner, fed the inner and put through bottom bracket guide. 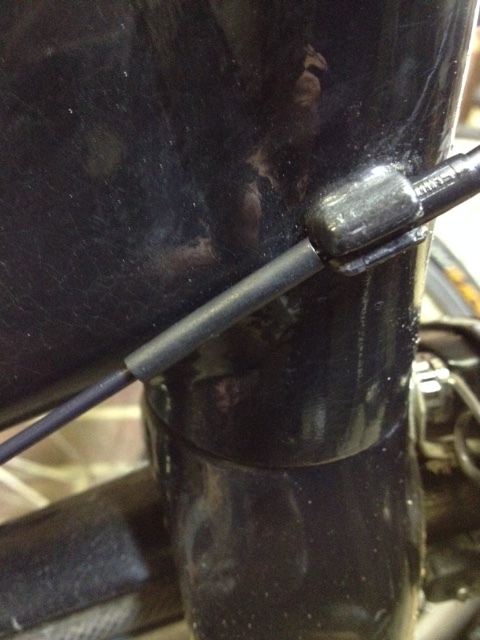 Beforehand I’ve greased whole inner cables with Rock’n’Roll cable magic. 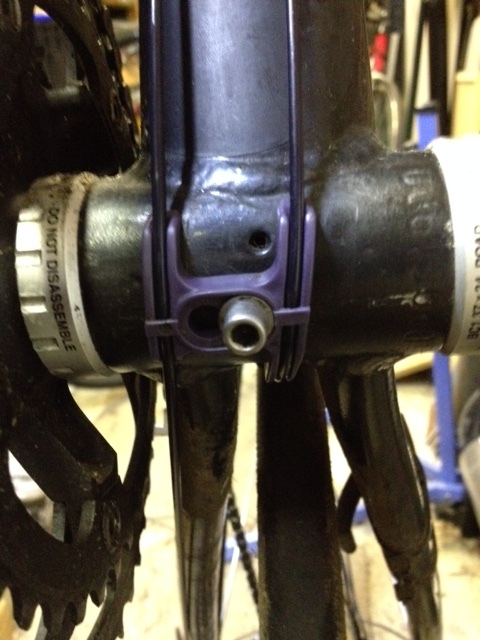 Surprisingly the liner fits inside bottom bracket guide without any modifications. To seal the connection between ferrules and liner I’ve used heatshrink. 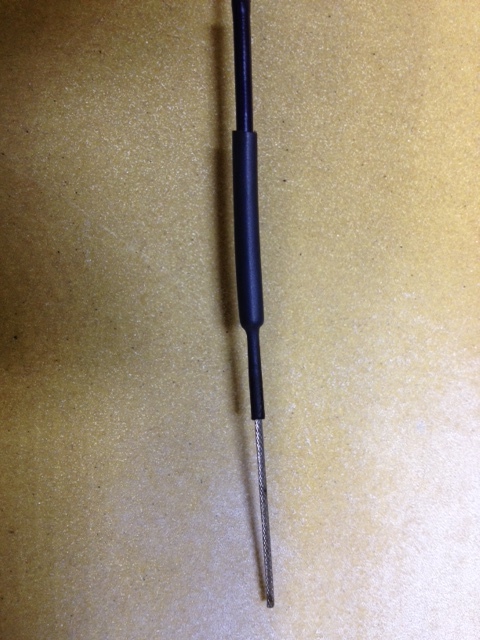 Also I’ve used another piece of heatshrink to make “telescopic” connection between liner and inner cable. For the rear mech I’ve used alloy ferrule with seal (Shimano is adding this to all new cable kits and that suppose to be fitted on chainstay). Quite like the look of these liners. Slick, completely black, doesn’t spoil overall look of the bike. Definitely better than exposed cables. Will see in the future how it performs, but so far no problems. 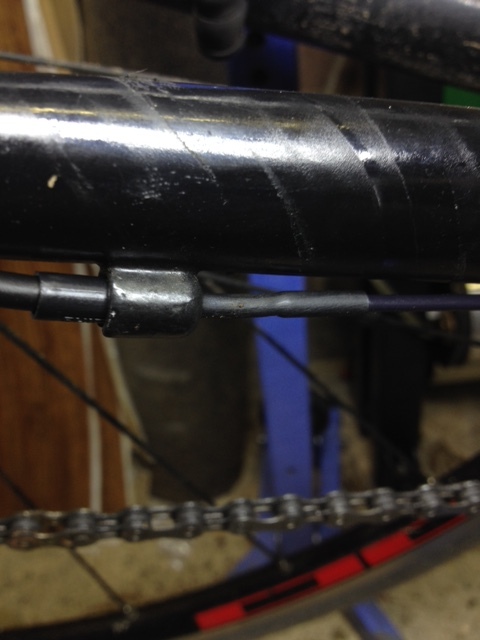 This entry was posted in DIY, problem solvers and tagged gear cable, nokon liner, nokon sealed gear cable, road bike gear cable, road bike gear cable change, sealed gear cable by myarseiskillingme. Bookmark the permalink.